SALES and reservations for Tulloch Homes showed an impressive increase of 27 per cent in 2013, making it their best-selling year since the global financial downturn in 2008. Chief executive of Tulloch Homes, George Fraser, reported that the market is strong across all areas of the business. He said: “Work will begin on site in June on the first phase of 53 units at our new multi-million-pound acquisition of the former McGinniss Group land at Slackbuie, Inverness. 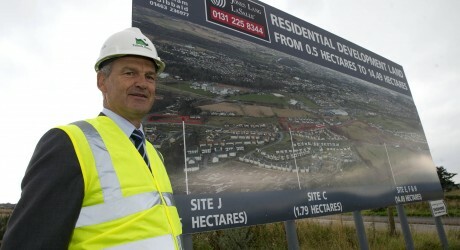 “By the time we build out the 350 homes on that land, it will be an investment well in excess of £80 million. Slackbuie gives us a major forward land bank, a massive asset. By contrast, the major new development at Hedgefield House, Inverness, will focus on executive flats, including targeting people downsizing from traditional houses. “There will be ten flats in the extensively refurbished mansion plus 30 new executive flats in a superb mature woodland setting. Later this month, the show home opens at Tulloch’s new Vista apartment block at Culduthel Inverness has had an excellent year across the firm’s portfolio of sites in and around the city. The Black Isle developments have also performed well. The roll-out of homes on Tulloch’s major site at Conon Braes will continue throughout 2014 while a fourth phase will begin at High Burnside, Aviemore. This investment underlines the benefit of the acquisition of Tulloch Homes in April 2013 by Candlewick Asset Management, a joint venture of investment banker, Goldman Sachs, and private equity house, TPG, who have been very supportive of our development programme. Inverness has had a very good year across our portfolio of sites while the Black Isle developments have also performed well. Another success has been the Tulloch Select Part Exchange Scheme which is proving extremely popular.